Demo im [renn.tv] Motor- und Sportblog von Mike Frison. In Stuttgart demonstrieren die Dieselfahrer. Finde ich ja witzig, dass sie das zu Fuß machen! Die Leute hätten besser mal gegen die Abschaltung der Abgasreinigung demonstriert. Ich mag bloggende Anwälte: sie helfen dem Laien Ereignisse juristisch einzuordnen und drücken sich dabei gewählt unanfreifbar aus - beides vom waltenden, aber nicht anwaltenden Blogger gerne konsumiert. Wie z.B. Markus Kompa - mit Sitz in Köln - zum Hutbürger. Super GT Demo beim DTM Finale. Totgesagte leben länger: beim finalen DTM Wochenende in Hockenheim werden zwei japanische Super GT Gäste ausrücken (Toyota/Lexus und Nissan/Nismo). Von Demorunden in Renntempo ist die Rede und ich schätze man möchte tatsächlich vergleichbare Performance testen. Das geht natürlich am besten, wenn man am gleichen Tag auf der gleichen Strecke unterwegs ist - dann sind viele Parameter identisch (Temperatur, Luftdruck, Streckenquarakter, Grip, etc.). Die 2019er DTM - ohne Mercedes - soll dann auch mit 2L 4 Zyl. Turbomotoren fahren - den haben die Japaner schon im Einsatz und fahren mit etwas über 600 PS. Damals - 2014 - dachten die Japaner, dass man sich auf das Wort aus Deutschland verlassen könnte. Jetzt fährt die DTM nach wie vor mit V8, die Super GT aber schon mit 2L Turbo. Der Ausstieg von Mercedes scheint ja dann doch ein paar ehemals bequeme Leute zu Aktivität bewegt zu haben. Le Mans 24 Hours - Mike´s Report. Here I am - back from Le Mans and I really needed a couple of extra days to let the event sink in. So many impressions, even though I only have been there for 2,5 days. you can click on all pictures to enlarge them. This was only my 3rd Le Mans visit after the bicycle trip 2012 and 2013, when I have been granted asylum at the Audi Sport Camp. As often the original plan was completely different: I handed in 1 week vacation and wanted to drive over for Sunday to Thursday. Then back home to enjoy the complex action on a multi-screen setup. Then this happened: PR of Ford of Germany - the Director Ralph Caba to be precise - got in contact and asked if I want to join their trip from Friday to Monday. Wait - WHAT? Let me offer some background to put this into perspective: I work for Ford since many years - I joined the organisation after my MSc in 1993 and had to move from London to Cologne. Where I stayed ever since - Ford is my first and only employer. It’s a great company and I work for Dealer IT Strategies for Europe, which I enjoy a lot. On the other side I work in the Motorsport area in one way or another since even longer. I run my own little business, which is nice because it’s so different to the big corporation. And it contributes to feed the family too. There was never a link between the two and I made efforts to keep it that way. Work is work and private is private. I would have loved to cover more Ford content in the past, but there wasn’t much happening from Ford in the sport I love so much. In January 2015 it changed big time when the Ford GT got introduced. Back then it was only a supercar, no mentioning of Le Mans even though everybody hoped it will take part. When Raj Nair came to Cologne one month later for the Focus RS introduction I asked him about Le Mans, but he kept the answer open. At last year’s Le Mans there suddenly appeared a Ford hospitality and then in June at the Le Mans 24 it became official: Ford will race in Le Mans. Suddenly it was all dreams come true for me and I first met the GT at Spa 6h. Being a Ford guy I got super-excited, my desktop at work changed to GT in no time ever since it got introduced. I had no connection to Ford Performance though, they are based in US and subject-wise pretty far from Dealer IT too. And then - out of nowhere - came this call asking if I want to join their flight to France. As you can imagine I made my decision faster than Williams makes a pit stop! Originally I would have taken my Transit, bike in the back and all equipment properly sorted to deal with anything, which might come up. But flying is a different story - also you have no van on site to quickly alter the equipment. I had a long thought about how to be able to do my usual photographing and blogging. With the great experiences I had with the 100D both in Spa als well as during the Nürburgring 24 Hours I decided to stick with that: lightweight and flexible beats heavy and bulky. Proved out to be the right decision, with a schedule packed like this you need to be able to use spare time to get productive. I got myself a larger WLAN SD card just in time. That way the best pictures from the 100D could go straight into my Instagram feed. In Le Mans I was really impressed by the location of the Ford hospitality. Look at this picture I uploaded to Facebook. Did you know that a smartphone panorama picture is automatically converted by Facebook into the new 360° experience? Give it a try - great feature! It made me sad - Le Mans will never be the same without him. Little camera keeps impressing me. Quite a contrast to my usual Transit flat! It was really nice and also silent, but as you can imagine there was no time to enjoy this. We had not a single breakfast there. However it was really nice to the eye. I wonder how long it takes to mow the lawn. Including Andy Priaulx, who I will always remember for his first appearance at the Nordschleife. Not only because he did it with the beautiful Ja zum Nürburgring Design, but also because he was the first one I remember, who came to the Ring and was directly up-to-speed. It’s pretty normal these days, but it was different back then. He went on to win the Nürburgring 24h that year with Dirk Müller coming in in second - on the mighty BMW GTR, for which I produced that well-know DVD movie. Andy confirmed he prepared well for that race - to make a difference these days you have to become even more professional. Next to him is Dave Pericak - head of Ford Performance - with Mark Truby on the left - VP for Ford of Europe PR. Did I mention that the hotel was rather nice? He is Ford’s CEO since July 2014, when Alan Mulally left the company. I never met him in person, so this was a bit special. He is more or less the boss of 200.000 people - including myself - so I thought I better behave for a change! Europe’s VP for Sales and Marketing. He too is a proper petrol head and seeing him standing there and watching the GTs on track was a real special moment. A kid on Christmas couldn’t be happier and for me it felt really good that we have racers up there in senior management positions. Next on the agenda was something I was looking forward to: a lap on the race track with a couple of Mustangs. I read about these hot laps before on the agenda and all of us got registered. But again it went completely different: Wolfgang Kopplin - on the right - joined the company in a similar time period as myself and we actually used to work together back then. He went on a steep career path and by now is MD of Ford of Germany. He wanted to know if there is something he shouldn’t miss and clearly these hot laps were my recommendation - can’t get much better right before the start. Only that no places were left anymore and there went my plan: I offered my seat. I actually enjoyed doing that because the more racing finds it’s way into our organisation, the better. It’s Wolfgang on the right and Matthias Mederer on the left. Matthias works as photographer for RAMP - can’t wait to see his pictures. He was part of our group of 5 from Germany and even though I didn’t hear of RAMP before, it got my attention now. The LMP3 were at 3:55, which is GTE level - while the GT3s were at 4:02,7 on this snapshot. I have to admit I didn’t mind that HJS didn’t cross my way at all during the weekend, as I expected him being super-present all time. Needless to say that the Audi looked much nicer back then. I’m sure we will hear more of Henry Ford in the future! For the team members grid walk can be boring, as it takes so long - on the other side tension is high - this is just 1h before race start! Daddy can’t come home with empty hands! I really like the 24h logo - it’s such a clever and beautiful layout - and timeless too. And our little girl enjoys it too! The rain became that strong that the race director decided to start behind the safety car. At Ford people were looking forward to the race - no matter what! When you hear them it’s already too late! As a French company Le Mans for them is really important and they supply tires to 33 teams. So how many tires would that be? As it turns out: 6.000! That’s a lot. Tires need to stay 1 hour at 80°C before they can go onto the race car. Pressure is 1,2 bar cold and 1,8 bar hot. In GT they usually drive 3 stints and in 4 in LMP 1. Not because the tire wouldn’t allow more, but everything longer might destroy their strategy due to the maximum allowed driving times of the drivers. The GT3 tires they use elsewhere are the same as the GTE tires they use here. Even though the works teams develop their own tire, they can only choose from a set of options. Michelin does not keep that secret, but instead would allow the competition to test the choice of the others too. However hardly a team makes use of that. … which turned out to be Keanu Reeves - Selfie time! I’ve never heard about Arch Motorcycle Company though - it is actually his own! How cool is that. Co-founder Keanu Reeves has logged tens of thousands of miles on all manner of motorcycles, all over the world. (..) In fact, he’s only ever owned a couple of autos – a vintage Volvo and a contemporary Porsche. They certainly got a new follower on Instagram now! You could see pit stops from above - see the GT on the monitor at the time everybody is trying to catch some action. How about a Lego GT40? We even had a little chat and it was nice to see that he really enjoyed the atmosphere. It looked good for Ford - but also for Toyota, which I liked a lot. So I tried to sneak into a pit - preferably the Ford one. Not easy, but I managed (thanks John!). … and needless to say it was very special for me too! … but what I loved most was the way Porsche handled the tragic events after the race. The no. 5 Toyota, which had a clear advantage and was ready to take the win, didn’t even classify, because it exceeded the maximum time of 6 minutes for the last lap. From the biggest success in Toyota’s history to nothing - within 5 minutes. When I tried to upload something it mostly failed due to the network overload. Lucky us that we had WLAN in the hospitality! Here they are again: Toni Vilander and Dirk Müller - remember the picture from the grid? … correction: 2 proud Mr Ford! Funny that, because the Champagne shower got invented exactly 50 years ago - when the Ford GT first won Le Mans! Only after reading this you realise what a tough job this has been. And over it was, the race went in no time and it took me a while to sort through all of the impressions I had in such a concentrated form! Ford’s performance has been a discussion point during and after the event. Clearly I’m biased - who wouldn’t after 22 years of service. Graham Goodwin just published this piece yesterday, which is an interesting read. Bottom line I’m proud that I was able to witness the race in such intensity and very much look forward to the things to come. If you made it to here: thank you for reading and I’m always interested to hear your feedback via social or email! Doch kein Tempolimit beim Industriepool. Hat sich Lamborghini eigentlich mal irgendwann stark gemacht für den Nürburgring-Erhalt? Aber Werbung mit der Nordschleife machen. Das können sie alle. Wer ist denn der Fahrer? Ist eine gute Runde! Das neue Narrativ der SPD. In der Demo und der Reaktion der (Westerwald = Hering) SPD gestern dazu ist ein Detail etwas untergegangen: die Partei hat ihr - von der Polizei abgeriegeltes - Treffen dazu genutzt, eine neue Sprachregelung zum Nürburgring auszugeben. Ihr seht schon, worauf das hinausläuft - mal mehr mal weniger deutlich. Natürlich lähmen die 500 Freizeitpark-Steuermillionen jegliche Diskussion über andere Themen - wie soll man auch jemanden ernst nehmen, der dermaßen verkackt hat? Was also tun? Man erklärkt das Problem einfach für beendet. Das macht die Politik gerne schonmal, wenn sie keinen Ausweg mehr weiss. Das Ganze wird dann noch positiv klingend garniert, “vorwärtsgerichtet”, “Zurück in der Zukunft” und zusammen mit den Dreyer Hütchenspielen (Politiker Rochade) glaubt man jetzt den Cunning Plan zu haben. Mit tatsächlichen Lösungen hat das natürlich alles nichts zu tun, eher mit Sand-in-die-Augen-streuen. Auch Kurt Beck hat mal beteuert, dass sein Freizeitpark den Steuerzahler nichts kosten wird. In Wirklichkeit hat er neben einer 9 bis 10-stelligen Summe Steuergeld noch ein weltweit einmaliges Kulturdenkmal oben draufgelegt, das dem Steuerzahler verloren geht. Damit ist die einzige Konstante, die sich durch den Ablauf der Jahre hindurchzieht, der Nicht-Wahrheitsgehalt der Aussagen der SPD Politik. Malu Dreyer knüpft da nahtlos an. So richtig stoppen kann das eigentlich nur die Staatsanwaltschaft, aber die scheint brav mitzumachen bei dem perfiden Schauspiel. Für uns erst Recht der Grund uns hinzustellen und sowohl Aufarbeitung als auch eine echte Zukunft für Sport und Strecke zu fordern. Wann ist die nächste Demo/Aktion? Ich stecke zwar noch mitten im Hausbau, aber dafür nehm ich mir immer Zeit, Ehrensache. Das Zünglein an der Waage. Am Samstag ist wieder Demo und wer noch überlegt, ob er (oder sie) hinfahren soll: macht es. Apropos Macht: wir haben mehr, als Ihr glaubt. Für die Politiker ist die Außendarstellung so ziemlich alles, was sie haben. Das Thema Nürburgring schlägt aktuell wieder hohe Wellen - leider - und wir alle sind es, die den Nürburgring repräsentieren. Da können wir nicht warten, bis das jemand anders machen - das können nur wir. Die Fans, Fahrer, Organisatoren, Beschäftigte, Unternehmer, Lokalpolitiker, Veranstalter, … - alle sind wir gefragt, es ist unsere Rennstrecke! Wenn wir es nicht machen, wer sollte es sonst machen? Und wir können den Politikern mächtig einheizen. Die fürchten nämlich nichts mehr als wütende und zornige Bürger, deren Statements dann womöglich noch in der Presse landen. Die Regierung steht mit dem Rücken an der Wand, den Insolvenzverwaltern gleitet das Verfahren aus den Händen, die EU begreift langsam, dass sie schwer geleimt worden ist … Niemand weiss genau, was es braucht, um den Verkauf zu stoppen, aber vielleicht ist unser Protest genau der Tropfen, der das Fass überlaufen lässt!? 15.Nov. in Mainz: SPD Parteitag inklusive Ringverkauf-Protest. Am 15.11.2014 findet in Mainz der Landesparteitag der SPD Rheinland-Pfalz statt. Wir halten diesen Termin genau richtig, um noch einmal mit breiter Front auf die Probleme am Nürburgring hinzuweisen. Aus diesem Grund wird es an diesem Tag in Mainz einen Auto-Corso sowie eine Kundgebung geben." Das ist schon das 2.Mal, dass der Nürburgring nach Mainz fährt - hier mein Bericht vom Februar diesen Jahres. Reden allein nützt ja nichts, Christian, Sabine und Ossi waren extra in der Staatskanzlei, die Frau Dreyer hat schöne Reden geschwungen in Mendig … und am Ende lässt sich uns doch eiskalt über die Klinge springen. Da hilft nur eins: Protest! Hier gibt’s die Veranstaltung auch auf Facebook, bitte fleissig teilen! Die Rhein-Zeitung hat das Thema heute auch aufgegriffen. Mikebericht von der Ringdemo Mainz-Nürburgring. 15.Februar: DEMO von Mainz nach Nürburg. Konnte ich mir natürlich nicht entgehen lassen, vor allem weil abends in Nürburg auch noch die After-Demo-Party anstand. Fast wie ein Fahrerlager - nur leider von den bekannten Fahrern bei der Demo kaum jemand zu sehen. Wolfgang Destree hat das ja treffend kommentiert. Nfiziert sind beide, aber bei wem hättet Ihr die Anhängerkupplung vermutet? Das ist der neue Verbandsbürgermeister der VG Adenau (Romes Nachfolger). Immerhin - er hat nicht wie sein Vorgänger gekniffen oder rumgeeiert, sondern klipp und klar gesagt, daß der Nürburgring in der öffentlichen Hand verbleiben soll. Wollen wir hoffen, daß er sich dafür auch stark macht. Hier noch ein paar mehr von meinen Fotos. Insgesamt wieder mal ein kräftiger, aber auch Spaß-machender Protest - die Sache zieht immer weitere Kreise. Ich habe ausnahmslos nette Leute getroffen, freundliche Gespräche geführt und viel Optimismus erlebt. Als ich als einer der letzten in Mainz losgefahren bin in der letzten Gruppe, sind die ersten Leute schon in Wehr von der Autobahn abgefahren. 600 Autos waren schon gezählt, als ich in Mainz auf den Parkplatz gefahren bin und unterwegs haben sich auch noch viele Leute auf der Autobahn dazugesellt. Die Feier mit Kölsche Musik war der krönende Abschluss für einen gelungenen Samstagnachmittag! Ich habe auch das Gefühl die Leute sind jetzt kampfeslustig, das darf gerne so weiter gehen - ruhig noch etwas lauter! Ich finde es super, daß es soviel Zusammenhalt gibt - und auch wenn die großen Namen lieber auf Tauchstation gehen und uns im Stich lassen, wir kämpfen weiter! Christian Menzel ruft noch einmal alle zur Demo-Teilnahme morgen auf. Nicht vergessen Eure Posts mit #ringdemo zu kennzeichnen auf Twitter, Facebook usw., dann lassen sich die Inhalte leichter finden. Wir sehen uns in Mainz! Die Nürburgring Insolvenzverwalter wollen mit allen Mitteln den Verkaufsvertrag durchboxen. Heute morgen habe ich noch gedacht, von dem Nürburgring Geschäftsführer Schmidt hat man auch lange nichts mehr gehört - also jetzt der Hockenheim-Schmidt, nicht der Quadratdoktor. Und schwups ist er in der Zeitung. “Hier hat sich eine Idee verselbstständigt. Ein ordentlicher Kaufmann hätte viel früher die Reißleine gezogen.” (..) Warnende Stimmen, so der Nürburgring-Geschäftsführer, habe es zu Genüge gegeben. Man habe sie nicht hören wollen. Schmidt: “Manche waren wie berauscht.” Es habe jedoch nicht lange gedauert, bis sich die “wirtschaftliche Wahrheit herausstellte”. Uups, was ist denn da los, da reibt man sich ja verwundert die Augen? Woher die plötzliche Einsicht? Inzwischen haben wir ja gelernt, nichts am Nürburgring ist Zufall und so geht es dem Herrn Schmidt auch nur um eins: Verkaufen! Die pöhse EU und die drohende Schließung - werden immer noch gerne als Argument vorgeschoben, obwohl sie doch längst widerlegt sind. Wisst Ihr noch? Hektischer Verkauf und so? Tja, da muß der Kommunikationsprofi schon ganz tief in seinem Lehrbuch blättern, wie er das wohl wieder gerade biegt. Der oder die Erwerber des Nürburgrings werden nur dann von einer möglichen Beihilferückforderung verschont, wenn nachweislich der Verkaufsprozess EU-konform stattgefunden hat. Erst haben sie über die Beschwerde von Otto Flimm in Brüssel gelacht - ganz gelassen - und jetzt wissen sie vor lauter Zurückrudern nicht mehr, in welche Richtung sie steuern sollen. Und das ist gefährlich, denn der Verkauf muß es sein - das wird durchgeboxt, als gäbe es kein Morgen mehr! Die Unterzeichnung eines Kaufvertrages wäre zunächst nur das “Signing”, wie Sanierersprecher Nuvoloni es ausdrückt. Das “Closing” erfolge erst nach der EU-Entscheidung zu den Beihilfen und der Rechtmäßigkeit des Verkaufsprozesses. Man habe noch nicht beim Signing einen neuen Erwerber, sondern erst beim Closing. Signing and Closing - oder besser Singing and Dancing wenn die Unterschrift auf dem Papier steht? Die glauben tatsächlich, sie kommen mit allem durch, denn genau diese Vorgehensweise haben wir mit dem Erlebnispark schon einmal erlebt: erst haben die Bagger und Betonmischer Fakten geschaffen, und später wurde sich um Finanzierung und Baugenehmigungen bemüht. In diesem Fall also erst einmal eine Unterschrift unter ein Vertragswerk setzen und dann die neuen Pseudo-Besitzer Fakten schaffen lassen. In der Hoffnung, daß man aus der Nummer später nicht mehr raus kommt. Wir werden nach wie vor nach Strich und Faden vorgeführt und die Presse lässt sich dabei auch noch willenlos vor den Karren spannen. Ich hoffe bei der #ringdemo am Samstag platzt Mainz aus allen Nähten! Der Bieterprozess am Nürburgring entwickelt langsam Fremdschämpotential. Vor garnicht allzulanger Zeit haben die Insolvenzverwalter getönt, daß die Bieter bei ihnen Schlange stehen. Jetzt lichtet sich so langsam der Nebel und es stellt sich raus, daß die Insolvenzverwalter bei den 2 bis 3 Bietern auf Betteltour gehen. Wie ein Mitarbeiter berichtet, versuchen die Nürburgring-Leute seit gut zwei Wochen vergeblich, Ecclestone zu erreichen, bekommen ihn aber nicht einmal ans Telefon. Die Insolvenzverwalter äußern sich auf Nachfrage auch hierzu nicht. Aus Ecclestones Umfeld ist zu hören, er sei mittlerweile „genervt“ von den ständigen Avancen. Wie peinlich ist das denn. Hallo Landesregierung? Bekommt Ihr überhaupt noch was mit? Ihr verantwortet gerade eine Insolvenz in EIGENVERWALTUNG! Für viel Unmut bei dem Bietertrio sorgte deshalb die Einschätzung eines Nürburgring-Mitarbeiters, wonach HIG kein überzeugendes Nutzungskonzept für den Komplex habe, sondern das bisherige Geschäft im Wesentlichen weiterbetreiben wolle. Sag ich ja: ausquetschen wie eine Zitrone. Wir - also Sport, Region und Rennteams werden die Dummen sein. Eine gute Gelegenheit nochmal alle Kräfte zu mobilisieren für die #ringdemo jetzt am Samstag, um den Verkauf noch zu stoppen! Keine vernünftigen Angebote für den Nürburgring? In meinen Augen sind das gute Nachrichten, denn eine Möglichkeit den Verkauf zu stoppen, wäre natürlich auch, daß es keinen Käufer gibt. Und was ist mit Capricorn oder der HIG Heuschrecke? Hier gibt es noch einen Bericht bei yahoo/AFP und erstaunlicherweise auch ein kritischer Bericht beim SWR. Ich hoffe mein Eindruck täuscht mich nicht, daß die IV’er auf dem Rückzug sind und doch nicht so schnell - hektisch! - der Verkauf durchgeboxt bekommen. Die Stimmen nach einem Verbleib des Rings in öffentlicher Hand werden jedoch immer lauter. Es gibt sogar - bereits 10 Tage vor der Demo! - eine Vorabmeldung im Focus und auch die WiWo hatte die Demo mit drin. Der Besuch bei Malu Dreyer. Gestern war eine Abordnung von Wir sind Nürburgring in der Staatskanzlei in Mainz, um 1 Stunde mit der Minsiterpräsident von RLP über den Nürburgring zu diskutieren (Sabine Schmitz, Ossi Kragl, Christian Menzel und Claire Craus). Starker Einsatz den Termin hinbekommen zu haben und die Zeit zu opfern, wir müssen weiter kräftig am Ball bleiben. Eine Wir-sind-Nuerburgring.de Webseite gibt es inzwischen auch. Wenn es nach den Insolvenzverwaltern geht, soll der Nürburgring am 17.Februar schon verkauft sein, das müssen wir verhindern. Ecclestone ist dann doch nicht mehr im Rennen, bei Capricorn gibt es viele Fragezeichen - dann bleibt eigenltich nur noch die amerikanische Private-Equity Heuschrecke H.I.G. Capital. Soweit zu den massig Interessenten, die bei den Insolvenzverwaltern angeblich Schlange stehen. Und Malu Dreyer verbreitet nach wie vor die Mär, daß sie hofft einen seriösen Investor zu finden. Das Wort Investor kann ich schon garnicht mehr hören und was es bedeutet, wenn der Ring mit Gewinnabsicht statt gemeinwohlorientiert betrieben wird, habe ich ja im Detail hier kommentiert. Kurzfassung: Totalkatastrophe! Hanna Breuer hat auf der FB-Seite von Malu Dreyer mal im Detail skizziert, wie HIG Capital arbeitet und was das für den Nürburgring bedeutet. Es gibt auch einen offiziellen Text von Wir sind Nürburgring zu dem Treffen. Sabine, Christian und Ossi treffen jetzt Malu Dreyer. Daumen drücken! Und am 15.Feb. können wir alle zeigen, was wir draufhaben, dann gibt’s den großen Mainz-Nürburgring-Protest-Convoy. Wir hatten lange keine Nürburgring Demo mehr - nächster Termin: Samstag 15.Feb. Am Sonntag gab es wieder eine Protestdemo von Wir sind Nürburgring - die Initiative von Christian Menzel, Sabine Schmitz, Ossi Kragl und vielen Helfern im Hintergrund. Die Polizei spricht offiziell von 450 Autos, die mitgefahren sind, zwischenzeitlich hieß es mal, es seien 700 Autos. Ich bin auch mitgefahren und es hat richtig Spaß gemacht, soviele Ring-Kämpfer zu treffen! Die Ns waren auch nicht zu übersehen und soviele ZO832 Kennzeichen gibt es sonst nur im Brünnchen - genial. Nur um mal ein Gefühl zu bekommen, wie lang der Convoy war: ich bin im hinteren Drittel gefahren und Chris (Kohlhaas) ziemlich weit vorne - wie immer halt ;) Als wir Richtung Andernach unterwegs waren, hab ich ihn angerufen, als ich auf der Höhe vom Rasselstein war. Da ist er gerade am Ende der Thomaser Hohl (an der Kaserne) wieder aus Andernach rausgefahren. Und beim Zwischenstopp an der ED Tankstelle Plaidt sind die ersten in Mendig angekommen, als die letzten noch an der Tankstelle waren. Und das war geschlossener Verbund, da hatte die Polizei tatsächlich mal die Straße nach hinten abgesperrt. Fotos hab ich auch gemacht, könnt Ihr Euch bei STR Facebook anschauen. Und - wer hätte das gedacht - ein wirklich guter und hintergründiger Bericht vom SWR. Malu Dreyer hatte zwar nur die üblichen Textbausteine, als sie gesprochen hat - aber immerhin hat sie sich auf die Bühne getraut, das hätten wir unter Kurt Beck nie erlebt. Das war das erste Mal, daß der (die) Ministerpräsident(in) zum Nürburgring-Thema zu den Leuten gesprochen hat! Peinlich genug, daß das so lange dauern musste. Aber das haben wir Christian & Co zu verdanken, die Aktionen haben uns die Tür aufgestoßen. Am Freitag sind sie zu einem Gespräch bei Frau Dreyer in der Staatskanzlei in Mainz, drücken wir die Daumen, daß es vernünftig ist. Und in der Zwischenzeit machen wir weiter Druck, das klappt ja immer besser! Die Politik muß endlich begreifen, daß sie Region und Sport nicht ignorieren darf! Das wird ein großer Spaß, solltet Ihr Euch nicht entgehen lassen! Auf Facebook haben schon 600 Leute zugesagt. Treffpunkt ist jetzt am Sonntag (26.Jan.) um 10 Uhr in Feldkirchen, Feldkircher Straße 100. Am Sonntag gibt´s die nächste Nürburgring Demo - alle mitmachen! Sabine und Christian geben richtig Gas und überall, wo in letzter Zeit rheinland-pfälzische Politiker aufgelaufen sind, war eine Abordnung Nürburgring Kämpfer vor Ort, um sie in Empfang zu nehmen! Andrea Nahles nachmittags in Mendig. Und von Feldkirchen nach Mendig gibt es einen lustigen Corso - das alles ist als Demo angemeldet. Und damit der Corso auch was hermacht, sollen möglichst viele Ringtools oder Transportfahrzeuge mitfahren. "Einen Neujahrsempfang der etwas anderen Art bereiteten dem rheinland-pfälzischen Innenminister Roger Lewentz von der SPD jene Menschen aus der Region, die sich gegen den Verkauf des Nürburgrings aussprechen. Vor der Rheinhalle in Remagen hatten sich am Donnerstag rund 80 Demonstranten mit ihren Transparenten eingefunden, um sich für die Nürburgring-Region und deren Interessen einzusetzen. Lautstark forderten sie: „Die Regierung hat es verbockt, jetzt wird der Ring verzockt. Der Ring für die Region, zurück mit den Millionen“, als der Minister eintraf." Aufgeben gilt nicht, Save The Ring! Seeeehr gewöhnungsbedürftig - Formula E versucht Donuts. Also ich bin ja generell für alles Neue offen und würde der Formula E echt gerne ’ne Chance geben, aber das ist - naja - unterirdisch. Oder wie WTF1 sagt, wo ich das gefunden habe: underwhelming. Die Demo wirkt noch nach, Christian Menzel gibt weiter Gas. Gegensätzlicher konnte die Resonanz nicht sein: Während über 2.000 Menschen jüngst gegen den drohenden Verkauf des Nürburgrings am Nordschleifen-Streckenabschnitt Parkplatz Brünnchen demonstrierten, blieb die Politik bis auf ganz wenige Ausnahmen der Veranstaltung fern. Ich glaube das wird ganz gut morgen! Die Norweger sind angekommen und sitzen jetzt hoffentlich in der Pistenklause. Auf Facebook haben über 2.000 Leute ihr Kommen angemeldet. Die Polizei rechnet mit großem Verkehrsaufkommen und sperrt sicherheitshalber die Straßen. Gleichzeitig geht dem Nixaussersichselbersanierer der Allerwerteste so auf Grundeis, daß er schon unter die Gürtellinie tritt. Alles in allem doch eine garnicht so schlechte Ausgangsposition. Bis morgen im Brünnchen! Der Insolvenzverdiener aus der Otto-Flimm-Straße 1. Zum einen ist es ja gut, daß Doppelpromovierte so mit dem Rücken an der Wand steht, daß er zu solchen Mitteln greifen muß. Auf der anderen Seite ist es aber unverschämt / perfide / hinterhältig / erbärmlich / unsportlich / charakterlos (sucht Euch was aus), wie er versucht Otto Flimm - OTTO FLIMM - irgendeine Schuld für die Abläufe der Vergangenheit in die Schuhe zu schieben. Da zeigt sich doch das wahre Gesicht des Mannes, von dem immer noch viele sagen, daß der arme Kerl doch nur seinen Job macht. Ich sage Euch, der sieht seine Felle davonschwimmen - diese Reaktion auf Otto Flimm einzuprügeln ist ja schon fast panisch. Vielleicht liegt es daran, daß jeder Brief, den er bekommt, an die Otto-Flimm-Straße 1 adressiert ist und er inzwischen an chronischer Flimmophobie leidet. Da kann ich nur ganz dringend eine fachärztliche Behandlung empfehlen! Auch wenn es alle wissen, man kann es nicht oft genug aufzählen: ohne Otto Flimm gäbe es den Nürburgring garnicht, denn er hat in den 80igern alle Hebel in Bewegung gesetzt, um die GP-Strecke bauen zu können, die vor genau 30 Jahren in Betrieb genommen wurde. Und er hat sich aufgerieben wie kein anderer beim Kampf gegen den Freizeitpark: während der Planung, der Erstellung, des Betriebes, der unseeligen Linder/Richter Verpachtung und jetzt dem Höhepunkt: der Insolvenz mit dem drohenden Rennstreckenverkauf. Der Weg nach Brüssel war der einzig mögliche, um die Problematik über die Grenzen von Rheinland-Pfalz zu transportieren und hätte er das nicht gemacht, dann wäre der Ring jetzt trotzdem mindestens genauso pleite. Vielleicht wäre Kurt Beck noch Ministerpräsident und Lindner/Richter die Pächter, dann sähe alles noch viel düsterer aus. Netter Versuch, aber der Einzige, der hier Ängste schürt, sind Sie! Die ewige Leier mit der drohenden Nürburgring-Schließung, wenn er nicht verkauft wird - weil die EU das angeblich so vorgibt. Ihnen glaubt doch niemand mehr! SIE sind mit Ihrer Faktenverdrehung die wahre Bedrohung für den Nürburgring - für die Jahre und Jahrzehnte, die nach dem Verkauf kommen werden. Für die illegalen Beihilfen, die in staatliche Hotels, Restaurants, Achterbahn, Disko, … geflossen sind, dürfen Sie sich bei Ihrem Kumpel Kurt Beck bedanken - die Rennstrecken haben von den Millionen keinen einzigen Cent gesehen und Otto Flimm hat die Bedrohung von Anfang als solche erkannt und bekämpft. Und hätten Sie nicht nur Ihr Bankkonto, sondern das Wohl des Rings im Kopf gehabt, dann hätten Sie Otto Flimm nicht in Brüssel ausgebootet, sondern hätten Seite an Seite mit ihm die Optionen ausgelotet. Aber das war ja garnicht in Ihrem Interesse und Ihr tatsächliches Handeln entlarvt Sie bis auf die Unterhose. Das setzt zwingend voraus, dass die Vermögenswerte des Nürburgrings einzeln oder gesamt an den oder die besten Bieter verkauft werden. Struktur- oder regionalpolitische Erwägungen dürfen nicht ausschlaggebend sein. Autsch. Das haben wir von Anfang an gesagt, daß es nur um’s Geld geht, aber es wurde regelmäßig dementiert. Jetzt gegen Ende wird zurückgerudert und ich bin mir sicher, daß derjenige die Nordschleife besitzen wird, der das meiste Geld auf den Tisch legt - wenn wir den Verkaufsprozess nicht dringend stoppen! Es wird kein Wohltäter sein - mit der Idee halten sich immer noch einige über Wasser - und dann heißt es Gute Nacht. Für den Sport, die Region und die Historie. Nicht für den Abwickler, der ist dann prächtig saniert! Ich komme in dem Artikel übrigens auch vor, mal zur Abwechselung nicht als Blogger sondern als 48-jähriger gebürtiger Mayener Ex-Motorrad-Hobbyrennfahrer. Nur leider kein O-Ton von Sabine und Christian, obwohl ich die Handynummern weitergegeben habe. Daß den Volkseigentumverhökern immer noch so eine Bühne geboten wird, finde ich unerträglich. Und solche Leute, die Otto Flimm diffamieren und dem Ring den finalen Todesstoß versetzen, dann noch als Sanierer zu liebkosen, setzt dem Ganze die Krone auf. Die ersten Demonstranten sind unterwegs - aus Norwegen! Das ist Pål gerade eben kurz vor’m Boarding, er macht sich mit Henrik aus Norwegen auf den Weg zum Brünnchen, um am Samstag um 5 vor 12 mit uns allen gegen den Nordschleife-Verkauf zu demonstrieren. Mega Respekt! … während auf Facebook inzwischen 1.900 Leute zugesagt haben. Daß man manchmal auf dem Brünnchen keinen Parkplatz findet, kennt wir ja. Daß das aber nicht an zugeparkten Autos liegt, sondern an demonstrierenden Bürgern - das ist neu! Ich freu mich drauf! :) Save The Ring! Landrat Jürgen Pföhler hat Wichtigeres zu tun, als sich um den Nürburgring zu kümmern. So ein Landrat ist ein vielbeschäftigter Mann, er hat immerhin Entscheidungen zu treffen! Da ist der Terminkalender proppenvoll und leider keine Zeit, um mit den besorgten Bürgern bei der Demo am Samstag zu reden. An seinem Nürburgring. Das muß man sich mal vorstellen. Andere setzen sich in Norwegen in’s Auto, um extra deswegen an den Ring zu fahren und der feine Herr Landrat hat Wichtigeres zu tun!? Vielleicht will der ein oder andere bitten, die Veranstaltung doch noch zu besuchen. Ansonsten bin ich gespannt, was für ein Termin das war, der wichtiger ist, als der Ausverkauf des Nürburgrings. Hab auf Facebook erfahren, daß der Landrat vor Ort “Cheesy” genannt wird, weil in jede Kamera grinst. Das passt. Was bedeutet das eigentlich, wenn der Nürburgring verkauft wird? Am Samstag ist die große Protest Demo - ab 5 vor 12 im Brünnchen. Sabine Schmitz und Christian Menzel werden unterstützt von vielen Helfern und wehren sich gegen den Verkauf der Nordschleife. Doch was würde das bedeuten, wenn die Nordschleife verkauft wird? 1. Öffentliches Eigentum wird Privateigentum. Damit geht es natürlich direkt mal los, was vorher uns allen gehörte, gehört nach dem Verkauf jemand anderem: einer Firma, einem Fonds, einer Privatperson … wer weiß das schon? Erst einmal vollzogen, ist der Kaufvertrag nicht mehr umkehrbar - dabei ist der Ring seit seiner Eröffnung 1927 fest in öffentlicher Hand. Dazu kommt der Denkmal-Charakter der Rennstrecke, die es so in dieser ursprünglichen und historischen Form nicht ein zweites Mal auf der ganzen Welt gibt. Wenn man die internationale Resonanz verfolgt, dann kann niemand verstehen, wie man als Staat auf die Idee kommen könnte, sich freiwillig davon zu trennen. Gehen wir der Einfachheit halber mal von einem Verkaufspreis von 100 Mio Euro aus. Die liegen ja nicht so rum, sondern die muß man sich entweder von der Bank leihen oder man setzt sie im Auftrag von Geldgebern ein. Das Investment den Nürburgring zu kaufen steht in Konkurenz zu vielen anderen möglichen Investments, mit 100 Mio Euro lässt sich eine Menge anstellen. Die Geldgeber - wer immer das auch ist - wollen natürlich was davon haben, daß sie ausgerechnet in den Nürburgringkauf investieren. Hätten ja auch was anderes mit dem Geld machen können, was ordentlich Gewinn abwirft. Also muß eine Rendite her. Setzen wir die mal niedrig an: 5%. Das sind bei 100 Mio Euro satte 5 Mio Euro pro Jahr, die der Ring mehr abwerfen müsste, als er es bisher getan hat. Wir reden hier nicht von Umsatz, sondern von zusätzlichem Gewinn. Wo das Geld herkommt? Entweder steigen die Preise kräftig oder es wird an der Instandhaltung gespart. Gerne auch eine Kombination aus beidem. Die Anlage wird runtergeritten und ausgesaugt. Und niemand kann etwas dagegen machen. Gemeinwirtschaftlich betrieben muß der Ring überhaupt keinen Gewinn machen, da reicht eine schwarze Null - also kein Minus. So sollten Sportstätten und Denkmäler - zum Wohle des Volkes - auch betrieben werden normalerweise. Bisher hatte die Nürburgring GmbH die Zügel in der Hand, sie war wie eine Behörde und wurde auch so behandelt. Der Ring liegt in einem hochsensiblen Gemenge aus Lärmschutz und Umweltschutz - kennt Ihr irgendeine andere Rennstrecke, die in einem Naturschutzgebiet (!) liegt? Als Behörde lässt sich einfacher mit anderen Behörden zusammenarbeiten, als dies je eine Privatfirma könnte. Erst einmal in privater Hand sind die Probleme vorprogrammiert. 4. Zum Wohle der Region vs zum Wohle des Investors. Manche haben es schon erfolgreich verdrängt, aber die Era Richter/Lindner vom 2.Mai 2010 bis 27.Nov.2012 hat uns einen deutlichen Vorgeschmack darauf gegeben, was ein Privatbesitzer veranstalten wird. Dabei waren die beiden nur Pächter - wie wird ein Besitzer erst der Region den Hahn zudrehen? Das Monopol der Rennanlage nutzend werden nach und nach die Dienstleistungsangebote, die sich über Generationen und Jahrzehnte am Nürburgring angesiedelt haben, aus eigener Hand angeboten. Dabei muß man noch nicht einmal den Konkurenzkampf über Preis oder Qualität fürchten, man hat die uneingeschränkte Hoheit über die Strecke, alle Kommunikation gebündelt und kann spielend leicht kleine lokale Dienstleister in’s Leere laufen lassen. Ganz heikles Thema. Ich hör dann immer gerne von den Leuten: “Die Touristenfahrten wird es immer geben, denn die bringen ja richtig Geld ein.” Das mag kurzfristig richtig sein und in den 2,5 Jahren, als die Richter/Lindner NAG möglichst schnell möglichst viel Geld scheffeln wollte hat man auch gesehen, daß der Verkehrsdurchsatz massiv erhöht wurde. Wenn man das Ganze aber etwas längerfristig betrachtet, dann sind die TF vor allem eins: ein unkalkulierbares Risiko. Nehmt zum Vergleich 20 reiche Sportwagenfahrer, bietet ihnen die Strecke exklusiv mit allem, was ein VIP so braucht - zu Kosten von 5.000 Euro pro Nase. Machen die sofort, das Geld interessiert sie nicht und wer will nicht in Ruhe mit ein paar Kumpels mal die Nordschleife genießen. Das sind schlappe 100.000 Euro an einem Tag - ohne Aufwand - ohne Risiko. Da sehen die TF ganz schön alt aus. Und die vielen Pensionen und Gästezimmer ganz schön leer. Schon jetzt sind die Streckenmieten aufgrund der kostspieligen Module, die sich die NAG’ler ausgedacht haben und die deren GF Schmidt jetzt weiterführt, kaum noch zu bezahlen. Bodenständiger, bezahlbarer Motorsport ist am Nürburgring kaum noch zu realisieren, die Vereine, die die VLN Veranstaltungen durchführen, sind froh, wenn das Wetter passt - so sehr ist das alles auf Kante genäht. Ein privater Besitzer - mit den oben beschriebenen Profit-Zwängen - wird unweigerlich weiter an der Preisschraube drehen oder sich weitere neue Zwangsmodule ausdenken, dann fällt’s weniger auf. Noch ein heikles Thema. In den vergangenen acht Jahrzehnten war die Nürburgring-Führung schlau genug, die Region am Geschäft partizipieren zu lassen. Das wurde unter Kafitz zwar grenzwertig ausgeschöpft, aber auch er war schlau genug, daß er genug Krümmel vom Tisch fallen lassen muß, um den Frieden zu wahren. Wird ein Privatbetreiber auch so weitsichtig agieren? Sobald die Region sich ausgegrenzt fühlt - oder auch Einzelne, deren Lebensplanung auf einmal ganz neue Wege finden muß - werden die sich überlegen, ob man die Lärm- und sonstigen Unannehmlichkeiten weiter ohne zu murren in Kauf nimmt. Sicher gibt es noch viele weitere Auswirkungen, die ein Nordschleifen-Verkauf mit sich bringt. Ich hab hier einfach mal runtergeschrieben, was mir so spontan eingefallen ist. Egal, wie man es dreht und wendet: der Nürburgring - und damit meine ich die Rennstrecken - muß in öffentlicher Hand bleiben und dem Gemeinwohl dienen. Wir sehen uns am Samstag im Brünnchen! Die Facebookseite von Malu Dreyer kennt im Moment nur ein Thema: Nürburgring. Jürgen Häfner - den haben sie uns immer vorgeschoben - wird Lotto-Chef. hat er brav die vorgefertigten Sprechblasen ausgesondert. Wer so linientreu das Volk hinter’s Licht führt, hat sich den warmen Lottosessel wirklich verdient! Jetzt liegt es an uns! Die Regierung tut so, als sei alles in Ordnung. Die Insolvenzverwalter haben es mit dem Verkauf dermaßen eilig, daß sie nicht mehr wissen wo oben und unten ist. Die Vorbereitungen für die Protest-Demo nächsten Samstag laufen auf Hochtouren. Das Rennen läuft, jetzt liegt es an uns! Sabine Schmitz und Christian Menzel rufen zu einer Protest-Demo, um sich gegen den Nürburgring-Verkauf zu wehren! Ablauf und Ort werden noch bekanntgegeben, aber bitte haltet Euch schonmal den Termin frei, damit richtig viele Leute zusammenkommen. Save The Ring ist übrigens vorgestern 3 Jahre alt geworden - naja - hat zwar niemand gratuliert, aber so wirklich ein Grund zum Feiern ist es ja auch nicht. Wir kämpfen und strampeln uns ab, doch die Politik interessiert sich nicht die Bohne für die Probleme. Sie wollen einfach nur an der Macht bleiben und dafür ist ihnen jedes Mittel recht. Kurt Beck verantwortet jetzt bei der Friedrich Ebert Stiftung wieder ein Jahresbudget 139 Millionen und seine Nachfolgerin Malu Dreyer lässt verlauten, daß der Nürburgring ihr keinen Anlass zur Sorge bereitet. Also Leute, wenn Ihr auch so wütend seid wie ich, dann lasst das nicht auf Euch sitzen und mobilisiert alle Kräfte, damit wir eine kräftige Demo bekommen, deren Wellen auch Mainz erschüttern! Und ja - Ihr habt Recht - viel können wir nicht mehr ändern. Aber wir sollten ihnen die geplante Zwangsenteignung so schwer wie möglich machen! Und wer weiss? Vielleicht kippen wir es ja doch! Meisterfeier Pheonix Racing im Eifelstadl. Phoenix hat gestern seinen DTM Meistertitel im Eifelstadl gefeiert. Unsereiner setzt da nichtmal einen Fuß rein, mir fällt sogar das Schreiben des Namens schwer. Da sind die Pluspunkte von der Demo in Mainz alle wieder weg. Mal was anderes: STOP WATCHING US Demo in Köln. Normalerweise geht es hier bei mir im Blog um motorsportliche Themen, aber hier mal etwas, was uns alle angeht. Es geht um nichts weniger als unsere Freiheit, die durch unsere Regierung bedroht ist. Dank Whistleblower Edward Snowden wissen wir, daß das verdachtsfreie und allumfassende Abhören aller Kommunikationswege nicht der Paranoia entspringt, sondern heute schon Realität ist. Gestern gab es bundesweit Proteste der Bevölkerung gegen die Überwachungsprogramme der Regierung, insgesamt sind in etwa 40 Städten Proteste organisiert worden. Auch in Köln ging es vom Platz vor dem Hauptbahnhof durch die Innenstadt zum Neumarkt. Ich habe mich ebenfalls den Protesten angeschlossen - auf der einen Seite war es schön zu sehen, daß ca. 700 auf die Straße gegangen sind - auf der anderen Seite hätten es auch ruhig viel mehr sein können. In Berlin waren es um die 7.000 Protestierer. Die Tagesschau hat so darüber berichtet. Heißes Sommerwetter, als sich die Leute bunt gewürfelt am Dom versammelt haben. Der Blick vom LKW, der als Bühne eingerichtet wurde. Bevor es losgeht, versammeln sich alle und es gibt verschiedene Reden. Seht Ihr links das Polizeiauto? So spärlich war tatsächlich der gesamte Polizeieinsatz - das hat mir richtig gut gefallen. Die Demo hat super funktioniert und wie man sieht geht es auch ohne Großeinsatz der Staatsmacht. Bradley Manning und Edward Snowden waren immer präsent. So bedrohlich die Verkleidung, so bedrohlich ist tatsächlich unsere Situation. Den interessierten Beobachtern wurden Handzettel verteilt und man hat die Leute aufgerufen, sich der Demo anzuschließen. Wenn die Bevölkerung auf die Straße geht, ist das ein Alarmzustand für die Situation unserer Demokratie. Miteinander statt Gegeneinander - eigentlich eine Selbstverständlichkeit, aber der Staat arbeitet aktuell gegen uns. ... und so hat das von der Bühne aus am Neumarkt ausgesehen. Gestapo > Stasi > NSA, das ist unsere Evolution. Freiheit bekommt man nicht geschenkt, man muss sie sich immer wieder neu erkämpfen. Man sieht die Überwachung nicht, aber das macht den Zustand so gefährlich. Wenn wir uns unsere Privatsphäre nicht zurückerkämpfen, wird das Auswirkungen auf das Verhalten der Menschen haben. Wollen wir wirklich in einer Welt leben, die durch Angst bestimmt wird? Unter dem Vorwand unsere Sicherheit zu gewährleisten? Bitte informiert Euch und kämpft für das, was Euch wichtig ist. #stopwatchingus ist der Hashtag und wird je nach Region unterschiedlich organisiert. Hier in Köln hat sich ein Bündnis gebildet. Teilt bitte dieses Video: Überwachungsstaat, was ist das? Mikebericht von SWR 4 Sendung gestern in Nürburg. Gestern war die Podiumsdiskussion, ging von 20 bis 22 Uhr. Wird aber heute erst ausgestrahlt (abends) und danach dürfen alle anderen, die das mitaufgezeichnet haben, es auch online stellen. Ich war gespannt wieviele Autos wohl da stehen, wenn ich um halb acht von der Touri-Einfahrt aus kommend nach Nürburg fahre. Und es waren viele, sehr viele! Parkplatz überfüllt und Wiese zugeparkt. Ich hab mich mal direkt bei einem Hotel in den Hof gestellt. So sah das vor der Halle aus. So einen Ü-Wagen brauch ich auch, Bloggermobil Deluxe! Viele Leute sind garnicht reingekommen, ich hab mir sagen lassen, daß selbst eine Anreise um zehn nach sieben nicht gereicht hat, um in der Halle einen Platz zu finden. Ich selber kam auch sehr spät (19:45) und hab mich mit dem dicken Fotoapparat bewaffnet reinschmuggeln können. In der Halle war die Lauf auch nicht die beste, war echt bis auf den letzten Platz rappelvoll. Jürgen Häfner, der hat als Vertreter-Vertreter-Vertreter mit Textbausteinen ausgestattet die Regierung vertreten. Genau derselbe Jürgen Häfner, der auch schon diese 3-stündige Vorstellungsrunde als Runder Tisch in Adenau verkauft hat und der der einzige war, den die Regierung zu der Demo in Mainz gelassen hat. Prof.Dr.Dr. Thomas Schmidt, der Doubledoc, der Kai Richter im treu-gucken-Dackelblick echte Konkurenz macht. und Hermann-Josef Romes, das Verbandsgemeindefähnchen, immer lächelnd und mit sich zufrieden. Moment mal!! Wo ist denn Otto Flimm? Noch nicht da? Kommt später? Vielleicht 2 Talkrunden? Ich kämpfe mich mal weiter nach vorne, garnicht so einfach bei so vielen Leuten. Stellt sich raus, Otto Flimm ist garkein Podiumsteilnehmer. Die haben den in's Publikum verbannt und waren dann mal so gnädig eine Gesprächsrunde mit ihm zu machen. Das ist auch der zweite Moderator, der heißt Heinrich Schöneseifen. Das war wirklich unglaublich, wie die den Otto Flimm abgekanzelt haben. Er konnte seine Statements garnicht richtig anbringen und hat im Vergleich zu dem Doubledoc zum Beispiel nur ein Bruchteil Redezeit bekommen. Aber trotzdem hat Otto Flimm die Chance genutzt Tacheles zu reden. Da war dann auch Schluß mit Dackelblick.Seht Ihr dort das Mikrofon? Kleines Detail nur, aber die Podiumsteilnehmer hatten alle ihr eigenes. Immerhin einer, der Spaß hatte! Viele Kameras hab ich gesehen. Überfüllte Halle und es waren einige Leute (200? ), die von draußen zugucken mussten. Nochmal ein Panoramabild, das geht echt gut mit dem iPhone. Dieter Frey musste sehr energisch darauf drängen, doch bitte auch einmal zu Wort kommen zu dürfen. Und hat dem Sanierer den Zahn gezogen, daß der Ring so furchtbar dringend verkauft werden müsse. Muß er nämlich garnicht. Das Beihilfeverfahren würde sich noch lange hinziehen und erst bei einem negativen Bescheid drohe ganz am Schluß auch eventuell die Schließung. Ist aber alles Zukunftsmusik, nur solche Optionen will man nicht hören. Nichtmal beim SWR! Manfred Sattler hat sich als IHK Präsident im Namen der regionalen Unternehmen zu Wort gemeldet. Das fand ich gut, denn die werden es echt schwer haben, wenn der Ring in ein gewinnorientiertes Privatunternehmen verwandelt wird. Er hat Dieter und mir auch ein Gespräch zugesagt und wir schauen mal, wie wir das umsetzen. ... und noch einmal deutlich gemacht habe wie frustrierend das ist, daß uns die Politik erst reinreitet und uns jetzt komplett im Regen stehen lässt - hat mich Herr Schöneseifen noch gefragt, wie denn die Rolle der Grünen zu bewerten sei. Ganz gezielt. Müsst Ihr Euch mal anhören. Da hatte ich das Gefühl, der ist doch mit Hidden Agenda unterwegs. Ich bin da garnicht groß drauf eingegangen, meinte nur, daß nach meinem Gefühl Eveline Lemke nicht mehr soviele Freunde in der Region hat. Ups, der Applaus dazu war dann doch etwas stärker als erwartet! Eveline: wenn Du das hier auch liest, wann warst Du das letzte Mal vor Ort? Vor zwei Jahren warst Du die glühende Kämpferin für Gerechtigkeit und die Nürburgring-Region, doch heute möchtest Du am liebsten nur noch Windräder in der Eifel abstellen? ... und sein Kollege Thomas Meyer. Ich weiß echt nicht, wie ich das einstufen soll, aber Moderatoren waren das nicht. Das waren verlängerte Arme von Regierung und Insolvenzern mit einem Schuß Oberlehrer. Das Ganze glich viel mehr einer Propaganda-Veranstaltung und hatte viele Ähnlichkeiten mit der Lindner/Richter-Nummer, als sie damals mit einer ähnlich inszenierten Geschichte der Bevölkerung Beruhigungspillen verabreicht haben. Der Doubledoc mit Dackelblick - wenn er bewusst gelassen redet versucht er wahrscheinlich so eine Art Hypnose, aber gestern sind ihm nur zwei SWR'ler aus Mainz auf den Leim gegangen. Egal was sie gesagt haben, Häfner und Schmidt haben nichtmal einen Anstandsapplaus bekommen. Zwischenrufe und ein paar Buuh's waren aber schon für sie übrig. Es war ihnen zwar nicht gleichgültig, aber die Welt geht für sie dafür nicht unter. Die sehen das gnadenlos als Job: gute Miene zum bösen Spiel. ... als auch der Insolvenzgeschäftsführer haben sich noch den Fragen gestellt. Das fand ich sehr gut, weil es war ja schon spät abends 10 Uhr. Nur viel dabei rausgekommen ist nicht wirklich. Dieter hat ihn auf die Problematik der Touristenfahrten angesprochen, die ein Privater in der jetzigen Form wohl kaum aufrecht erhalten könne. Es wurden Argumente ausgetauscht ... um dann festzustellen: der Geschäftsführer dachte es ging um die Achterbahn. Manchmal bekommt man Zweifel, ob er wirklich ganz im Thema ist. Cover Gerri hat das dann in seiner unnachahmlichen Art mal klargestellt. Hinterher waren sich alle einig: die Politik zieht das gnadenlos gegen den Willen der Bevölkerung und Sportler durch. Was mich noch mehr stört als die Tatsache an sich, ist daß die meinen wir wären tatsächlich so doof als würden wir das nicht kapieren. Der multiple Dottore mit seiner aufgesetzten Besonnenheit und dem eintrainierten Dackelblick, der Herr Häfner mit den bedeutungslosen, aber wichtig klingenden Worthülsen und dann die zwei Moderatoren, die mir teilweise richtig gebrieft vorkamen. Öffentlich-rechtlich ist da nur noch die Bezahlung, die nämlich von uns kommt, der Rest wird den Akteuren offensichtlich aus dem Mainzer Politikerbüros in's Lastenheft geschrieben. Wie es jetzt weitergeht ist schwer zu sagen, aber ich hatte das Gefühl, daß immer mehr Leute bereit sind, die Ärmel hochzukrempeln. Natürlich drängt jetzt die Zeit enorm, bis zum 15.Mai sind es nur noch gut 2 Wochen und wenn die Ausschreibung erstmal raus ist, wird es noch viel schwerer als jetzt. Wir müssen der Politik zeigen, daß wir uns nicht vorführen lassen und genauso wie Otto Flimm gestern dafür kämpfen Gehör zu finden. Wir sehen ja, daß es funktioniert! Wieviel einfacher wäre es, wenn ein paar bekannte Fahrer oder Marken sich auch für ihre Nordschleife einsetzen würden. Wink! Wink! Mittwoch 15.Mai ist eigentlich der Korsomittwoch vom 24h-Rennen. Den Korso gibt es nicht mehr, das 24h-Rennen vielleicht auch bald nicht mehr. Denn Mittwoch der 15.Mai ist genau der Tag, an dem Der Nürburgring zum Verkauf ausgeschrieben wird. Das hat der Gläubigerausschuss letzten Freitag einstimmig entschieden. Also mir würde das 24h-Rennen ganz schön im Hals stecken bleiben. Es wäre das letzte 24h-Rennen so wie wir es kennen und der ADAC hat ja schon gesagt, daß er sich auf Richter/Lindner 2.0 nicht einlassen wird. Noch ist es nicht soweit, denn noch können die Rennstrecken aus dem Verkaufsprozess ausgegliedert werden. Wenn denn das Land überzeugt wird, daß das eine gute Lösung ist. Denn im Moment steuert die Regierung schnurstracks auf einen Komplettverkauf zu - ohne Wenn und Aber. Im Klartext wollen sie die Nordschleife zu Geld machen, weil der Beck°Park der totale Katastrophenausfall ist und durch die Nordschleife vielleicht doch noch ein paar Milliönschen reinkommen. Auf der anderen Seite jedoch haben die Rennstrecken an dem Umbau garnicht teilgenommen - von der Tribüne mal abgesehen, aber die vorher war ja auch ok - d.h. man könnte durchaus argumentieren, daß keine verbotenen Beihilfen in die Rennstrecken an sich geflossen sind. Und diese als Sportstätten weiterhin gemeinnützig und zugänglich für den Sport betrieben werden können, d.h. die Strecken aus dem Verkaufsprozess herausgetrennt werden. Es liegt jetzt an uns diese Argumentation mit Nachdruck nach Mainz zu tragen, damit man sich von dort aus nach Brüssel aufmacht. Uns bleiben nur noch 23 Tage! Ein Termin, der eigentlich zufällig entstanden ist, ist der nächste Donnerstag abend in Nürburg. Da kommt nämlich das SWR 4 Radio mit der Sendung Klartext und veranstaltet eine Podiumsdiskussion in der Gemeindehalle. Bitte macht Euch ALLE auf diese Veranstaltung um 19 Uhr zu besuchen! Wenn die Straßen verstopft sind und die Halle aus allen Nähten platzt, dann können wir zeigen, daß wir es ernst meinen. Gerade auch an die VLN Teams, die am Donnerstag anrücken: bitte lasst den Ring nicht im Stich - kommt mit Mann und Maus ALLE zur Gemeindehalle. Auch auf die Gefahr hin, daß in Nürburg das mittlere Chaos ausbricht: den SWR Leuten muss die Kinnlade runterfallen. Und bitte keine Ausreden. Vor allem nicht bei mir. Was hab ich die letzten Jahre für Entbehrungen auf mich genommen, da wird es sich doch einrichten lassen 2 Stunden in Nürburg zu opfern. Wenn wir das bis 15.Mai nicht hinkriegen und die Nordschleife tatsächlich versteigert wird, dann haben wir alle auf einmal sowieso viel mehr Freizeit, als uns lieb ist. Neuer Talk - Olli Martini zu Gast. Nürburgring - Proteste in der Region. Kommentare wie immer gerne (Forum / Facebook). War schon unser 7.Talk! Mit dem ist er zusammen mit Markus Schmickler 2. in der V6 Klasse geworden, in der 16 Teams gestartet sind. Im Gesamt war das der 41.Platz bei 193 Startern - mit einem Auto aus der Serienwagen-Klasse! Adenau sagt Ja zum Nürburgring. Olli meinte ja schon, das mit Adenau liegt an der kurzen Zeit, die seit der Demo zur Verfügung stand und die umliegenden Gemeinden werden mit offenen Armen eingeladen miteinander Flagge zu zeigen. Vor 30 Jahren: Ja zum Nürburgring Demo. Aus dem Familienalbum von Marc’s Vater Achim Hennerici, da blutet einem das Herz, daß der Nürburgring nach diesem erfolgreichen (!) Kampf vor 30 Jahren jetzt schon wieder auf der Kippe steht. “Wer will den Tod des Nürburgrings verantworten” steht auf einem der historischen Plakate. Werden das Malu Dreyer und Clemens Hoch sein, die endgültig als Ring-Killer in die Geschichts-Bücher eingehen? Oder schaffen sie in Brüssel nächsten Donnerstag die Rettung und den Verkaufs-Stopp? Ich bin ja nicht so der typische Fotograf, wie sie am Ring häuftig anzutreffen sind. Mir geht es mehr um ein eigenes gut sortiertes Archiv (dann komm ich nicht in Urheberrechts-Schwierigkeiten) und um die umfassende Doku hier für die Seite (schon 70.584 Fotos aktuell, sortiert nach Event und alle kommentierbar), wie z.B. auch von dem Besuch in Mainz. Ab und zu kommen aber auch bei mir Anfragen - kannst Du mal dies schicken, kannst Du mal das schicken. Klar kann ich, aber wenn ich mir schon die Zeit für die Geschichte hier insgesamt mühselig aus den Rippen leiern muss, woher soll ich dann noch die weitere Zeit nehmen, um den Leuten noch all ihre Gefallen zu tun? Ich schätze mal die vielen Fotografen verwöhnen und erhöhen die Erwartungshaltung, der ich aber nicht gerecht werden kann. Ist schon ’ne groteske Situation: da machst Du Dir die Mühe und fotografierst, zeigst die Bilder dann auf der Seite, die Leute möchten die aber dann in groß haben und unter’m Strich sind sie dann sauer, wenn man höflich versucht zu erklären, daß das nicht so einfach ist. Wie oft mir das schon passiert ist. Und die Fotoanfragen sind ja nur eine Rubrik der Emails, die so auf einen reinprasseln. N-Aufkleber, Zimmerempfehlungen, usw. - naja - das volle Programm halt. Und wo wir schon dabei sind und das auch öfter gefragt wird: nein, bei mir kann man keine Fotos kaufen, ich biete das nicht an. Christian Menzel zu Gast im Talk. ... dann kommt der Nürburgring nach Mainz! So weit, wie die meinen, ist es nämlich garnicht nach Mainz und wer die Motorsportler kennt, weiß, daß sie sich nicht so schnell die Butter vom Brot nehmen lassen. Der Korso baut sich auf - schonmal jemand 2 Ringminis auf einmal im Einsatz gesehen? Originaler Erlebnisgrab-Flyer von 2007, damals hätte es noch verhindert werden können. Ich hab es nicht geschafft, innerhalb von einer Stunde die ganze Länge abzulaufen. Die denken nämlich, mit uns könnte man es machen! Der Audi mit dabei, Ehrensache. Sabine kämpft für uns und den Ring. Otto Flimm, kämfperisch - viel Publikum! Hanns-Martin Fraas und Ernst Moser. Uschi Schmitz und Hannes Scheid. Mein Bild auf der Bühne, hatte ich auch noch nicht! Hallo Mainz! Wir können gerne nochmal kommen! Alexander Licht und Julia Klöckner. Otto Flimm kann es nicht fassen, wie uns mitgespielt wird. Dieter Weidenbrück - hat die ganzen Frontscheiben-Aufkleber gestiftet! Staatssekretär Häffner - kaum auszuhalten, nur Ausreden und die üblichen Textbausteine. Die führen uns komplett vor! Erstmal über 10.000 Unterschriften überreichen. Ringlegende Helmut Dähne und Ringlegendin Sabine Schmitz - machen sich Sorgen. Und die Politdarsteller? Auf dem Sprung zum nächsten Termin. Schnelle Runde, Zweiradhelden: Helmut Dähne, Kalle Müller, Jürgen Müller. Schnelle Leute? Da darf Christian Kohlhaas nicht fehlen. OK, fahren wir wieder nach Hause. Aber keine Sorge: wenn das nicht läuft, wir kommen wieder! Jetzt kennen wir ja den Weg. Hier noch ein schöner Bericht aus der Rhein-Zeitung, hätte ich mir fast das Bloggen sparen können ;) Toll gemacht, und viele Sachen von anderen Leuten eingebunden - gefällt mir! 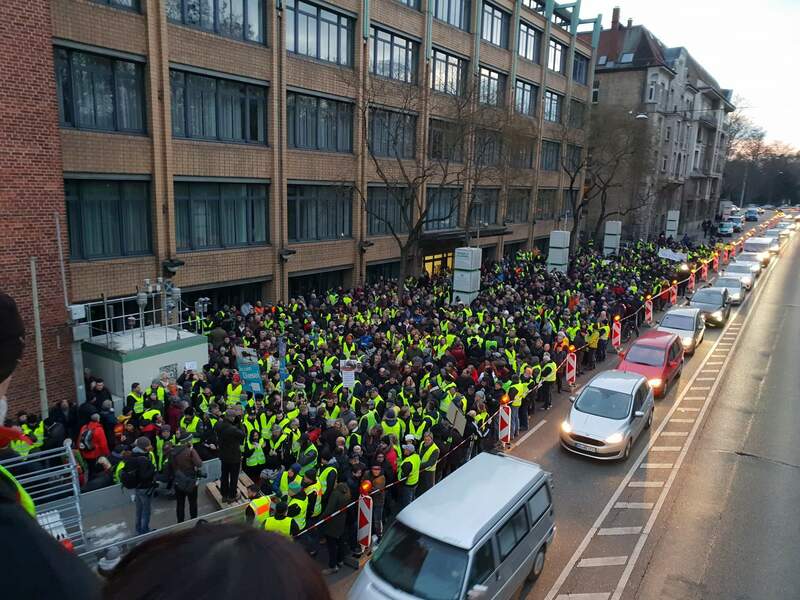 Demo Treffpunkt geändert: Jetzt Wackernheim. "ACHTUNG! ÄNDERUNG DES TREFFPUNKTS: Treffpunkt ist um 11 Uhr in Wackernheim, Ober-Olmer Straße. Der Aufstellort für den Korso musste kurzfristig geändert werden. Der Neue Aufstellort befindet sich in der Ober-Olmer-Straße in Wackernheim. Die Teilnehmer werden vor Ort von Ordnern zum neuen Treffpunkt geführt." Ist nicht weit weg vom Flughafen, siehe goo.gl/maps/6RYsp. So kommt Fabian Sigwart morgen zur Demo nach Mainz. Und falls sich einer mit dem weiten Weg herausreden will: der Fabian kommt mit seinen Leuten aus Zürich, um für den Ring zu kämpfen. Im Talk: Warum wir am Dienstag in Mainz für den Nürburgring demonstrieren. Heute wieder mit Dieter verabredet und wir haben uns darüber unterhalten, was von der Demo am Dienstag erwartet werden kann und warum wir als Nutzer des Nürburgrings geschlossen auf die Straße gehen. Der Motorsport muss mit an den Verhandlungstisch und Otto Flimm vereinigt alle Sportler-Interessen hinter sich. Die überhastete Verkaufsplanung der Rennstrecken muss gestoppt werden - das Schaffen von vollendeten Tatsachen muss vermieden werden. Diskussionen gerne im Forum / bei Facebook und alles zu der Demo am Dienstag findet Ihr auf der Homepage von Ja zum Nürburgring. Das macht er doch garnicht. Wo hat der ADAC eine Stiftung vorgeschlagen? Das wird solange in den Raum geworfen, bis es alle glauben. Die Demo setzt sich für Gemeinwohlbindung ein - die Unternehmensform ist da doch erstmal zweitrangig. Meiner Meinung nach haben die Medien dieses Stiftungsgespenst selber konstruiert. Das passt natürlich den Insolvenzverwaltern prima in’s Geschäft, denn auch eine Überführung in eine Stiftung ist ein Eigentümerwechsel, also ein Verkauf. Denen ist egal, an wen sie verkaufen, Hauptsache verkaufen! Deshalb wird immer wieder subtil untermauert, daß der Verkauf beschlossene Sache sei - oder eben alternativlos. Aber genau einen Verkauf will Otto Flimm und die Demo ja verhindern! Die Rennstrecken sind Volkseigentum und sollen es auch bleiben. Eine Stiftung nützt da erstmal garnichts. Am Dienstag schlägt der Ring in Mainz auf. Bei der Otto Flimm Veranstaltung vor genau 2 Wochen am 2.März in Nürburg waren breit gefächert alle verantwortlichen Politiker aus der Mainzer Landesregierung eingeladen - und keiner ist gekommen. Das war nicht nur eine bittere Enttäuschung, sondern (wieder einmal) ein überdeutliches Signal, daß man ausgerechnet mit denen, die diese Sportstätte am meisten angeht, nämlich DIE SPORTLER, nicht gewillt ist zu reden. Wenn die Politiker nicht zum Nürburgring kommen, dann kommt der Nürburgring zu den Politikern! Der Aufstand in der Region um den Ring ist zwar nach wie vor eine bittere Enttäuschung, aber ich hatte ja 5 Jahre Zeit mich daran zu gewöhnen, von daher keine Überraschung. Was mich aber positiv stimmt, daß zum letzten Gefecht auch reichweiten-gewaltige Personen wie Peter Meyer aufbrechen oder Organisationen wie der ADAC-Nordrhein. Die wissen genau, daß der deutsche Motorsport schon mächtig auf Kante genäht ist und jeder private, gewinnorientierte Betrieb mit den Folgen für Streckenmiete und Zugänglichkeit das Fass zum Überlaufen bringt. So wird dann auch ohne lang drumrum zu reden der Abzug der ADAC Veranstaltungen in Aussicht gestellt, sollten GP-Strecke und Nordschleife tatsächlich den Besitzer wechseln. Dann gehen am Ring nicht nur für die Zuschauer mächtig die Lichter aus, sondern auch für die Breitensportler. Wer aktiv mit etwas Dynamik und Wettbewerb auf solchen Veranstaltungen unterwegs ist, weiß wieviel ehrenamtliches Engagement nötig ist, um einigermaßen mit einer schwarzen Null solche Rennen zu stemmen. Und trotzdem muss mit ordentlichem Startgeld das Fahrerfeld zur Kasse gebeten werden. Die Verscherbler nennt man lobend Sanierer und der gescheiterte Beck°Park wird allumfassend Nürburgring genannt. Beides völlig an den Haaren herbeigezogen, aber wenn man es lange genug macht, glaubt man es irgendwann sogar selber. Das Ziel dieser Manipulation ist ganz klar: die Nordschleife ist das wertvollste Asset im Nürburgring-Angebot und man möchte es sich unauffällig zunutze machen, um mit dem Verkauf Geld für die Freizeitpark-Insolvenz herbeizuschaffen. Bisher sah es auch so aus, als kämen sie damit durch. Buchstäblich in letzter Sekunde scheint es langsam durchzusickern, was das für den Ring und den Sport bedeuten würde und der Widerstand formt sich viel massiver und geschlossener als vorher. Das ist auch für die Regierenden eine neue Situation und wer die Motorsportler kennt: einmal in Bewegung gesetzt hält die so schnell keiner auf. Die tragen auch ein 2. oder 3.mal den Ring nach Mainz und auch wenn die nächsten Wahlen noch 3 Jahre entfernt scheinen im Frühjahr 2016 - wenn man jetzt weiter versucht, die Ring-Nutzer zu übergehen bzw. zu übertölpeln, könnte das für die jetzt Handelnden bei den nächsten Wahlen noch ein ziemlich bitteres Ende bedeuten. "(..) Jetzt hat Meyer die Notwendigkeit gesehen, sich nach langer Zeit mal wieder zu Wort zu melden: Wegen des anstehenden Verkaufs der Rennstrecke attackiert der ADAC-Boss die rot-grüne rheinland-pfälzische Landesregierung um Ministerpräsidentin Malu Dreyer (SPD) – und droht mit dem Wegzug aller ADAC-Rennveranstaltungen aus der Eifel. „Ich habe den Eindruck, dass sich die Regierung mit einem Verkauf einfach des Problems entledigen will. Zu Lasten der Automobilindustrie, die auf dem Nürburgring testet, zu Lasten des Motorsports und der Großregion Eifel“, sagt Meyer im Gespräch mit der WirtschaftsWoche." Das tut gut, Rückendeckung zu bekommen, wenn man auf die Straße geht. Die Veranstaltungen auf dem Nürburgring sind laut Frey zu mehr als 90 Prozent Breitensportveranstaltungen, zudem sind in die Rennstrecken selbst praktisch keine Beihilfen geflossen." "Dem immer lauter werdenden Protest wird die Landesregierung vor der eigenen Haustür in Mainz nicht so leicht ausweichen können wie der Mitgliederversammlung von „Ja zum Nürburgring“ vor zwei Wochen in Nürburg. Mehrere Regierungsmitglieder waren eingeladen, unter anderem auch Ministerpräsidentin Dreyer und ihre Stellvertreterin Eveline Lemke (Grüne), der für den Nürburgring zuständige Innenminister Roger Lewentz (SPD) und SPD-Fraktionschef Hendrik Hering. Dem Verein um seinen Vorsitzenden, den früheren ADAC-Chef Otto Flimm, stieß bitter auf, dass alle eingeladenen Regierungsvertreter absagten, mitunter sogar recht kurzfristig." Es braut sich was zusammen, nur noch 3x schlafen! Hat sich rausgestellt: iss nich wegen iss nich. War auch so eine Lektion. Für uns. Die Lektion für die Regierung kommt dann am Dienstag! Daher nochmal mein Appell: alles was Beine hat in alles was Räder hat und auf zum Regierungssitz am Dienstag! So eine Chance, zu zeigen wer wir sind und wieviele wir sind bekommen wir nicht so schnell nochmal. Kleine Talkrunde zu den Nürburgring Perspektiven. Dieter Weidenbrück (z racing team) hat sich eine halbe Stunde Zeit genommen, um mit mir über den Nürburgring zu reden. muss der Nürburgring wirklich verkauft werden? und die Demo am Dienstag 19.März in Mainz. Fragen oder Anregungen gerne im Forum oder bei Facebook und wenn jemand mal Lust hat im Talk mitzumachen - bitte melden! Mit Google Hangout braucht man nur Webcam und Browser und los geht’s. 2 Jahre SAVE THE RING. Ist schon witzig zu sehen, was alles aus einer Idee werden kann. Auf der anderen Seite natürlich frustrierend, wie wenig wir Bürger zu sagen haben. Gerade am Ring wurden (werden?) wir nach Belieben ausgetrickst und vorgeführt und die Verantwortlichen flüchten sich im schlimmsten Fall in den Ruhestand. Mit Rente Höhe sorgenfrei und prall gefülltem Konto versteht sich. Am 9.Dez.2010 - das war vor genau zwei Jahren - habe ich so Save The Ring in’s Leben gerufen auf Facebook: hier ist Post Nummer 1. Dem Ring geht’s zwar nicht besser - im Gegenteil - aber was will man ausrichten gegen so einen übermächtigen Gegner? Politisch gewollt - na vielen Dank. Volksvertreter - wer glaubt das noch? Die letzten 5 Jahre waren für mich ein Paradebeispiel wie verottet unsere Gesellschaft inzwischen geworden ist. Leider sind die Politiker sind nur die, die wir verdienen. Manchmal wünsche ich mir ich wäre so naiv geblieben, wie ich es vor 5 Jahren tatsächlich war. Daß es nicht nur mir so geht weiß ich aus Gesprächen mit anderen Ringfreunden. So wenig wir ausrichten können, umso mehr freut einen doch das ein oder andere Signal, daß nicht alle Hoffnung umsonst ist. Happy Birthday & Save The Ring. ... kann man heute kaum noch Schritt halten. Seit gefühlten 20 Jahren gibt es wieder eine Pressemitteilung der Nürburgring GmbH. Die hat sich bisher ja aus allem rausgehalten und sich vornehm auf die Aufgaben als “Besitzgesellschaft” reduziert. Was jetzt ziemlich paradox ist, weil die ebenfalls das Nürburgring Logo benutzen. Also einer von beiden - NAG oder NG - benutzt es rechtswidrig, ich wüßte auch schon wer. Ist da eigentlich auch Schadensersatzanspruch geplant? Es gibt wieder mal einen neuen Geschäftsführer (Thomas Schmidt, Trier) und einen Sachwalter (Jens Lieser, Koblenz). Die beiden inszenieren sich mit Hilfe einer ebenfalls neuen PR Bude (Krisen-PR, das ist Dederichs Reinecke auch - Steinkühler sowieso). Gaaanz bedeckt gibt sich die Landesregierung. Die ganze Inszenierung halte ich für die Ausrede-Strategie im Stile von: “Da können wir jetzt nichts machen, da müssen wir die Auflagen der Insolvenzverwalter befolgen.” Genauso wie die Grünen nach Machtübernahme sich mit “Da müssen wir uns an den Koalitionsvertrag halten” aus der Verantwortung gestohlen haben. HALLO?? RENNSTRECKE?? Au Mann, das wird noch bitter. Der goldene Handschlag für Richter/Lindner heißt jetzt Räumungsvergleich. Womit dann jetzt endgültig das nächste (letzte?) Kaptitel des Drehbuches Nürburgring Privatisierung in 5 Jahren eingeläutet wäre. Was mich an dieser groß angelegten Volksenteignung am meisten wundert: daß die Leute es mit sich machen lassen - oder für ein paar Krümelchen vom Tisch dabei mithelfen. Wi-der-lich. Der “Wirkliche Neuanfang” sieht dann erstmal so aus, daß die NG das Ganze in Eigenverwaltung durchzieht und so wichtige Gläubiger wie “Ja zum Nürburgring” nicht zur Gläubigerversammlung zugelassen werden. Super. Und wie es weitergehen soll, wissen die beiden auch schon: Vermarktungskonzept aus einem Guss. Mir bluten die Ohren, so oft mußten wir uns das die letzten Jahre anhören. Was der Ring braucht wäre mal ein richtiges Aufräumen - also inklusive Ausmisten. Und dann Leute, die wissen was der Unterschied zwischen einer “Infrastruktur” und einer Rennstrecke ist. Ganz besonders einer so historisch bedeutenden. Die Nürburgring GmbH (NG) gehört zu 90 Prozent dem Land Rheinland-Pfalz und zu zehn Prozent dem Kreis Ahrweiler. Seit Mai 2010 ist die NG nur eine Besitzgesellschaft und Verpächterin der Formel-1-Rennstrecke und weiterer Einrichtungen wie Freizeitpark, Hotels und Geschäfte. Die NG beschäftigt 30 Mitarbeiter. Die Nordschleife wird schon garnicht mehr erwähnt, was für ein Trauerspiel. Bernie Ecclestone scheint ein Geschäft zu wittern. Der Wochenspiegel hat sich mal umgehört. Motorsport Magazine - like the “Disneyland on wheels” bit. Vor einem Jahr war übrigens die STR Demo am 24.7.2011 - hab das mal zum Anlass genommen die Bilder hier als Fotoreport einzubauen. Niemand hat die Absicht … die Wahrheit zu sagen. Niemand hat die Absicht eine Mauer zu errichten. Es wurden weder Kosten noch Mühen gescheut, den Arbeitsuchenden, aber vor allem dem Steuerzahler eine vorher versprochene, hohe Anzahl von neu geschaffenen Arbeitsplätzen zu suggerieren, obwohl man wissen musste, dass alles mit “sehr heißer Nadel“ gestrickt und absehbar schon im Vorfeld zum Scheitern verurteilt war. Vermutlich nach den Prinzipien : “Augen zu und durch“ sowie “die Hoffnung stirbt zuletzt“, nahm man von Anfang an billigend in Kauf, mit den Hoffnungen und Gefühlen von Menschen “Schindluder“ zu betreiben. Allerdings nicht heute, sondern vor fast 2 Jahren (23.Jan.’10). Wer jetzt noch nicht beim Verachtungsmaximum angekommen ist: man dachte wohl, so eine Demo in Mainz wäre noch eine feine taktische Maßnahme zur Mietminderung. Da geht Schindluder ja noch als Kompliment durch. [ENGLISH] Exactly 1 year ago Save The Ring started, however it was more of an accident. Jalopnik had a story on Sabine and they used my picture for it - like many others did before. Feedback was overwhelming and I had the feeling that it might be not too late to create awareness and spread more information. Webseite was next and just before Christmas I used my tiny S95 to record a short clip with Sabine. That helped a lot to spread the message and the Facebook site went off like mad. Being realistic, we are still David vs Goliath here, but people are much more up to speed with all the things going on and we had some nice highlights too: great support from the 24 Hours teams, the demo during F1 GP and the STRassenfest to name but a few. In the meantime things at the Ring getting worse every day - latest news report about massively overstated spectator figures - again. Winter looks to become quiet - not surprising in the rather tough Eifel area, but contradicting their ambitious plans to run a full-year leisure park. Which is why they did all this change-over in the first place. Wilhelm Hahne ist nicht kleinzukriegen. .. beschäftigt sich mit dem leidigen Thema der “Balance of Performance”. Allein schon das Wort sollte aus dem Motorsport Vokabular gestrichen werden. “Die Ausgeglichenheit im Wettkampf” - das widerspricht sich doch schon! Die sollen nur weiter so machen, dann kommt bald ein Motorsport Format aus dem Nichts, das den Namen Sport dann auch wieder verdient hat. Die Leute lassen sich nicht unbegrenzt an der Nase herumführen. .. ist eine brisante Hintergrundstory zu Kurt Beck’s OLG Querelen. Wer das alles miteinander verwandt und bekannt ist in einem Atemzug mit Urteilen “Im Namen des Volkes” - schwindelerregend. .. beschäftigt sich mit ebendem, den es aber leider nicht mehr gibt. Über 30 Termine des Parlaments, ohne Abschlußbericht. Farce trifft es doch ganz gut. .. Falschgeld am Ring? Mal wieder nur von W.H. ausgegraben, in den Nachrichten hab ich davon nichts mitbekommen. Wollen die überhaupt Verbrechen aufklären? Unter den Teppich paßt am Ring doch lange nichts mehr. .. die Kette der Fehlplanungen am Ring will einfach nicht abreissen. Ist ja auch kein Wunder: niemand schneidet die alten Zöpfe ab! Hat ein bischen gedauert (technisch bedingt), aber hier sind meine Fotos vom 6.VLN-Lauf. Ist ja jetzt auch das neue 20832.com Startseitenbild und hat die Demo abgelöst. 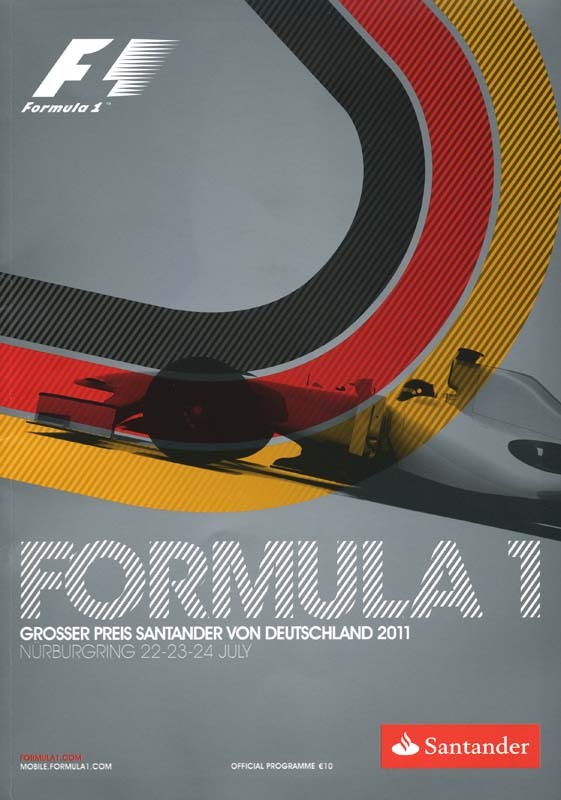 Der 2011er Ring GP ist inzwischen auch bei progcovers.com gelistet. Riesensammlung von “Motor Racing Programme Covers”, natürlich auch Nürburgring. STR’d 2! Tolle Arbeit von Malcolm Mitchell. Der Scirocco Cup heute (DTM) gibt’s auch als Live Streaming von Wige/VW. Heute Sa. 17:00 Uhr. Der 2011 Mid Ohio Sports Car ChallengeSpotter Guide ist online. Tolle Arbeit wieder mal von Andy Blackmore. Sind nur 4 LMP1 am Start, aber wird sicher trotzdem ein Top Rennen. Die Webcam an der GP-Strecke ist zum gefühlten 50.Mal außer Funktion. In der Vergangenheit hat man schonmal einen Hinweis gepostet in dem Stil “Habt Ihr schon gesehen? Eure Cam streikt, könnt Ihr da mal schauen?”. Es gab auch immer eine zuckersüße Antwort “Vielen Dank für den Hinweis, wir werden das weiterleiten …”, aber wenn sie immer wieder aussteigt, gibt man das auch dran. Ist ja ’ne Mietsache schätze ich und hoffentlich machen die alles wieder schön ganz, wenn sie (bald?) ausziehen müssen. Die Sache mit eben-mal-das-OLG-Koblenz-auflösen wird eine heiße Kartoffel für Kurt Beck. Richtig so! Was der Feudalherr als “untergeordnete Behörde” bezeichnet ist im Sinne der Gewaltenteilung zur Machtbegrenzung vorgesehen. Ein Wort, das der Herr Beck garnicht gerne hört. Ich hoffe sein über Jahrzehnte gesponnenes Netz fliegt ihm so richtig um die Ohren. Und sein weltfremder Leuchtturm in der Eifel gleich mit. Nachhaltig! Nürburgring Formel 1 mit einer ganz normalen PR-Kampagne. "Eine normale PR-Kampagne", so nennt die NAG die LOVE THE RING Nummer, die sie mit aller Macht am Formel 1 Freitag rausgehauen hat. Am Formel 1 Freitag!! An dem man als Rennstreckenbetreiber ja sonst nix zu tun hat. Die Rhein-Zeitung nennt das "Bizarres Sticker Wettrüsten". Wie originell das ist, habe ich ja schon beschrieben und mit der weit im Vorfeld angekündigten SAVE THE RING Demo hatte diese Überraschungs-Kampagne natürlich auch nichts zu tun. Eigene www.love-the-ring.org Microsite mit mehreren URL's und Interaktion. Ansteckbuttons wurden auch gefertigt, sogar DC muß dafür herhalten, ob er die Vorgeschichte kennt? Der neue Disko- und Hoteldirektor Dirk Metzner rührt die Werbetrommel für einen Profilbutton in Facebook: "Alle mitmachen! Ein Riesen Spaß!" "Die Eintragung ins europäische Markenregister erfolgte als vorbeugender Schritt, um die Botschaft "Love The Ring" in jedweder Form zu wahren und der Vermischung mit anderen Interessengruppen vorzubeugen." Nein, Ihr wollt lieber nicht wissen, was ich von Euch halte. "Es gibt kaum eine Sportstätte in Deutschland, in die die Fans so viel Leidenschaft investieren. Der Nürburgring hat sich in acht Jahrzehnten immer wieder neu erfunden und verändert und stets wurde das auch misstrauisch beäugt. Eine gewisse Verunsicherung ist dabei auch in der jetzigen Situation verständlich. Wir wünschen uns hier jedoch oft ein wenig mehr Fairness. Denn nicht selten versuchen Vertreter von eigenen Interessen, z.B. aus der Politik oder Wirtschaft, die Fans für ihre Ziele zu instrumentalisieren. Wir setzen eine offene Kommunikationspolitik dagegen, denn es ist immer besser miteinander zu reden, statt übereinander." Fairness? Offene Kommunikationspolitik? Instrumentalisierung? Eigene Interessen? Fotos von der SAVE THE RING Demo am Formel 1 Sonntag. Das war ein großer Spaß heute bei der Demo, sind auch so um die 200 Leute zusammen auf die Straße gegangen. Sogar das Wetter hat mitgespielt, obwohl die Wettervorhersage übelst war. Eveline Lemke war auch vor Ort und hat sich viel Zeit für Gespräche genommen. Informationen zum Save The Ring Aktionstag am 24.7. Am Sonntag den 24.7. 2011 führt SAVE THE RING eine Demo in Nürburg durch – den SAVE THE RING Aktionstag. Treffpunkt dieser polizeilich genehmigten Demo ist um 09:00 Uhr an der Gemeindehalle Nürburgs, Graf –Ulrich-Halle, wo bei rechtzeitiger Anreise auch Parkmöglichkeiten bereitstehen. 1982 ins Leben gerufen, wurde der Begriff schon 2007 zur Aufklärung unlauterer und inzwischen offensichtlich auch krimineller Machenschaften beim Projekt „Erlebnisregion/Nürburgring 2009“ wieder belebt. Die Demo gestalten Fans, Pensionsbetriebe, Gastronomen, Unternehmer, Rennsportteams aber auch der Verein „Ja zum Nürburgring“, vertreten durch den ADAC Ehrenpräsident und FIA Ehrenpräsidenten des weltweiten Motorsportverbandes Otto Flimm. Sie sind für den Nürburgring und sein Kerngeschäft, für den Motorsport auf der Rennstrecke, für den Spitzensport wie den Breitensport. Für die Großen Preise wie die F1. Sie fordern eine klare Trennung von Rennstreckenbetrieb und dem Erlebnispark „Nürburgring 2009“. Sie leben und arbeiten in der Region und werden z.B.. durch den Ring-Betreiber Nürburgring Automotive GmbH , der Rennstreckengeschäft und Gastronomie/Dienstleistungen koppelt, aus dem Markt verdrängt. Sie sind für die Einhaltung von Wettbewerbs- und Kartellrechten und fordern die Landes - Regierung auf, dafür Sorge zu tragen, dass dies auch am Ring umgesetzt wird. Sie sind für den erfolgreichen Einsatz des Untersuchungsausschusses für das Projekt „Nürburgring 2009, sowie die damit verbundene Entfernung aller Profiteure und Kollaborateure, die sich daran bereichern. Sie fordern eine lückenlose Aufklärung wohin ihre mehrere hundert Millionen Euro Steuergeld geflossen sind. Sie fordern eine öffentliche Ausschreibung für einen erfolgreichen und langfristigen Betrieb des Nürburgring. Sie alle gehen für den Ring auf die Straße, um ein deutliches Zeichen der Solidarität für den Nürburgring abzugeben und auf die Missstände machtvoll hin zu weisen! Unsere Demo am Sonntag macht überraschend viele Schlagzeilen. Hätte ich nicht gedacht, daß es so einfach sein würde, das in Mainstream Medien wiederzufinden. Fällt wohl auch fruchtbaren Boden. Mit Jörg Lindner’s Medico Fonds beschäftigen sich immer mehr Anwälte. Die sicherste Achterbahn der Welt. Sollte heute dann nach 2 Jahre in Betrieb gehen. Oops, TÜV vergessen. Schuld sind natürlich die anderen..
Etwas Lesestoff zu den aktuellen Problemen von Mr.Ecclestone. Holt Euch den kostenlosen Aufkleber! Das ist ja mal originell, inkl. den “Neuesten Liebesbotschaften”. Ich sag mal voraus, das erledigt sich bald von selber. Bizarres Sticker-Wettrüsten zur Formel 1. Siehe dazu auch mein Eintrag im englischen Mike’s Blog. Neueste Buh-Männer: Quadfahrer. Von den “vielen Eifler Offroad Parks” kenne ich leider keinen einzigen. Wäre schön, wenn es sowas wirklich auch gibt. Kennt wer einen? “Doch die Automotive richtet das Rennen nicht allein aus. Nach dem Zuschlag ließen Lindner und Richter zwei neue Firmen eintragen: Die Grand Prix Rheinland-Pfalz GmbH & Co. KG und als Komplementärin die Grand Prix Rheinland-Pfalz Verwaltungs-GmbH. Lindner und Richter sind jeweils einzelvertretungsberechtigte Geschäftsführer. SAVE THE RING Demo am Formel 1 Sonntag. Treffpunkt ist die Gemeindehalle in Nürburg (neben Getränke Schmitz in der Nähe vom Hotel Tiergarten) und der Protestmarsch setzt sich um 11:45 Uhr in Bewegung. Hier gibt es alle Details auf Deutsch oder Englisch und sogar einen Link für Facebook-Verweigerer. Ich finde die Initiative klasse und sie zeigt, daß die Leute inzwischen die Ärmel hochkrempeln. Noch ist es nicht zu spät den Ring zu retten und es werden immer mehr Aktionen, die deutlich machen, daß die Entwicklung in eine falsche Richtung gesteuert wird. Mir persönlich gefällt sehr, daß diese Demonstration ohne mein Mitwirken zustande gekommen ist. Von mir aus könnte jeden Tag Demo am Ring sein! Je mehr Aktionen gezündet werden, umso mehr wird der Widerstand nach außen sichtbar. Die Initiatoren geben sich viel Mühe und lassen keine Gelegenheit aus, um auf den Termin hinzuweisen. Die Gradwanderung fällt nicht immer leicht und nicht alle Reaktionen sind positiv. Ich jedoch lasse mir den Marsch nicht entgehen und hoffe, daß möglichst viele Leute dabei sind. Die Route ist recht übersichtlich und geht so wie ich das verstehe von der Nürburger Gemeindehalle bis zum letzten Kreisel an der Fahrerlager-Einfahrt. Ich werd auch zeitnah berichten und ein paar Bilder machen - Ehrensache! Save The Ring. Die alte DTM kommt zurück ... auf die Grand Prix Strecke?Die alten DTM Autos dürfen nicht auf die Nordschleife - na das macht ja mal richtig Sinn. Sicher organisatorische Gründe. Wenn ich dran denke was für Klimmzüge für ganz andere Sachen gemacht werden, ein echtes Trauerspiel. Zum Beispiel das Top Gear Demo beim 24h-Rennen.